29 August 2016, 12:00 AM. Hey, guys. Welcome to another edition of You Should Read This. 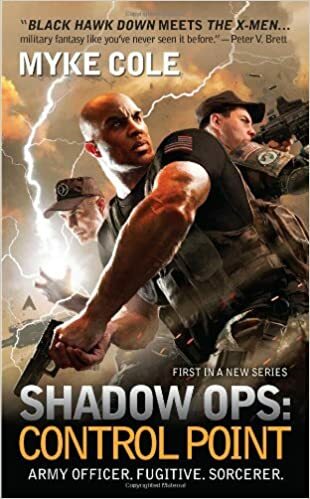 Today, I’ll tell you all about the debut novel by Myke Cole, and the first entry in his Shadow Ops series, Shadow Ops: Control Point. Book blurb, courtesy of Amazon.com. The SOC knows how to handle this kind of situation: hunt him down—and take him out. Driven into an underground shadow world, Britton is about to learn that magic has changed all the rules he’s ever known, and that his life isn’t the only thing he’s fighting for. Like a lot of books I’ve recommended, Shadow Ops: Control Point (and the Shadow Ops series in general) is Urban Fantasy. But there’s two things that differentiate it from most UF books: first, it’s set in an Unmasked World, meaning that magic and the supernatural are out in the open, rather than being secret; second, the protagonist is part of the military, rather than being yet another detective or similar character. And if anything, those make this series something really special. Unmasked Worlds aren’t exactly the norm in UF, and while this book is told largely from a military perspective, Cole does provide hints at how the world has responded to the sudden appearance of magic. There’s mention of Europe being under the control of an anti-magic Muslim Caliphate (a concept which I personally find unlikely, but we’ll get to that later), and the Chinese government has worked to integrate magic-users into various aspects of their society – there’s mention of using earth-magic in construction projects, for example. And in the US, magic-users are conscripted into military service, a decision which has resulted in an armed rebellion led largely by Native American magic-users. And while I haven’t personally served in the military, I’m willing to bet that the depiction of life in the armed services is pretty accurate, because Myke Cole is himself a veteran, having served in Iraq. But it’s not all chest-thumping über-patriotism; the military in the novel does a lot of questionable, if not out-right bad stuff, beginning with forcefully conscripting magic-users. Yes, there are good soldiers, and nothing they do is ever entirely evil, but they’re not all shinning paragons of virtue, either. And I like that, because I think it’s a very realistic approach to the military in the modern world. But while the book is great, it’s not without its faults, three of which really stood out to me. The first (and probably most nit-picky) is with the naming convention for magic – the names for just about every type of magic classified by the US government is an example of whatevermancy. Water magic is “hydromancy”; fire magic is “pyromancy”; etc. But then there’s earth magic, which is referred to at “terramancy”. Now, you might be wondering why this bothers me. Well, here’s why – it doesn’t fit the naming convention. Every other elemental magic uses the Greek name of the element (which actually makes sense), but earth magic uses the Latin. So, logically, earth magic should be “geomancy”. Yes, it’s a stupid, minor complaint, but I have trouble believing that no one would have brought this up at some point. The next one is also minor, but it really threw me out of the story. As I mentioned before, Europe has been taken over by an anti-magic Muslim Caliphate. While it’s only mentioned once, that instance really threw me out of the story. Though I don’t know the religious demographics of Europe, and this book was published in 2012, I have trouble buying into the idea of many European countries (particularly countries like France, which I believe is specifically mentioned) would somehow come under the control of a fundamentalist Muslim government, especially one that not only doesn’t make use of, but actively opposes the use of magic. Maybe this gets explained in a later book, but at the moment, I just don’t see how this could come about. My third problem is more one of craft than the writing itself. This will contain minor spoilers so if you don’t want anything ruined, just skip down a bit. Okay, so after Britton’s powers manifest, he goes on the run, as explained in the blurb. He manifests in a military hospital, and manages to escape. He tries going to his parents, then things go bad, and he runs. Then he goes to a friend’s workplace, realizes he has nowhere to go, and tries to surrender. Then, for no apparent reason, he changes his mind, and escapes for a third time. Finally, he ends up at a farm of some random guy. The farmer calls the authorities, and Britton is finally captured by the military. My issue here is that the “something goes wrong, Britton flees” cycle is repeated one too many times for my tastes. This violates the standard Rule of Three. I get what Cole was going for here. Britton’s powers alienate him from his fellow soldiers, his family, his friends, even complete strangers – there’s nowhere that he’ll be safe. But I can’t shake the feeling that the book could have been slimmed down a bit if Britton had just surrendered after his friend doesn’t help him, or if the run-in with his friend had been removed all together. The extra repetition of this cycle feels like fluff to me, and there’s plenty of other stuff that could have been done to fill out the word count. I also have some issues with Britton’s motivations. I’m okay with him changing his views of the military as time goes on, but those views seem to flip from positive to negative and back again far too easily, in my opinion. I can get behind them flipping once (say, when the military turns on him after he manifests), but I have trouble buying how easily they change again later on. There’s another character who has the same flip, and I see even less reason for her change of opinion, other than some form of cult-like indoctrination, which I don’t think would work, given what we learn about her background. But despite my complaints, the book is still pretty good. The world could use a bit of fleshing-out, but that’s to be expected from the first book in a series, and from what we do see, Cole has a lot of interesting ideas to work with. Highly unlikely. Yes, it was written in 2012, but even so, the “muslims are taking over” nonsense was as untrue back then as it is now. It’s the same as with the “majority of drugdealers in Maine are coloured or hispanic” (actually out of 1200-ish, only 14% were this: the remaining 86 were white) balderdash we hear. And, as you mentioned, it would never happen with France and the clout the EU has. Not to mention how, in all likelihood, there would be armed resistance from heavily Catholic countries, the Eastern states (Ukraine? No, Mykraine) and any country that was once under the thumb of the Ottoman Empire. Anyway… it sounds interesting, if slightly reminiscent of Bourne. Does Britton actually rebel after he’s caught again? Also, this may be a plotpoint, but how does a sorcerer get caught? Aeromancy, you mean? I am certain hydro refers to water. Does Britton actually rebel after he’s caught again? Don’t want to get into spoilers, but after he gets caught, he’s shipped off to learn/serve on the front-lines of a conflict in another dimension (it’s… complicated), falls back into being a good soldier, then sees some not-so-great stuff and goes “screw this” again. This would be the “switches stances too easily” bit I mentioned. Also, this may be a plotpoint, but how does a sorcerer get caught? Well, having magic is more like being a mutant in X-Men – you get a particular king of power, and it’s up to you to learn how to make use of it. For example, Britton can open up doors between our world and the dimension he’s sent to. Pretty handy to get around, but the portals can also be used to cut people up. Also, newly-manifested manifested magic-users tend to not have much of a handle on their powers. And there’s a whole bunch of magic-users whose only ability is to block other people’s magic. Yeah, I missed that. It’s been fixed. @terramancy – Yeah, that was my reaction, too. Do you know of other military UF? Or thriller-style UF in general? I’ve found all of one, and it was pretty good, but I don’t remember the title or the series. This seems really cool, although it does seem to have a few problems, it’s rare to read a military centered book that isn’t littered with hyper-masculinity. I also like Urban fantasy, and I really like the twist of everyone suddenly have magical abilities, and the military (and the government) have to deal with the fallout. @swenson: I can’t think of any other works in the same vein (military UF), but Cole’s published two more books in this series, plus two books of a prequel trilogy, so at least you’ve got a few books to work with. @Gigi Kiersten: Well, it’s set some time after magic starts showing up, so not so much dealing with the immediate fallout as still adjusting to the new status-quo. Sounds rather interesting. Urban Fantasy doesn’t have much of unmasked world trope ( at least I haven’t read any that have first book begin with unmasking, let alone have it in background. Exception would be Mercy Thompson). Military aspect also sounds like good thing. I understand your confusion. Really, why sudden Latin? As I live in Europe, I too say that radical Muslim Caliphate coming to the power is highly unlikely ( and though I haven’t read book, it sounds as if they are antagonistic, which turns me bit off). Especially in Balkan and Eastern countries, who had problems with Ottoman Empire for centuries, stretching to 20th century. Well, there are the works of Laurell K. Hamilton, but I wouldn’t recommend them. I will, however, recommend the Kitty Norville books by Carrie Vaughn – read my review of the first book here. The European Caliphate is only ever mentioned in the first book, so I can’t say exactly how antagonistic they are. Most of the actual fighting is either with American soldiers, goblins from another dimension, or Native American rebels working with some really nasty monsters.